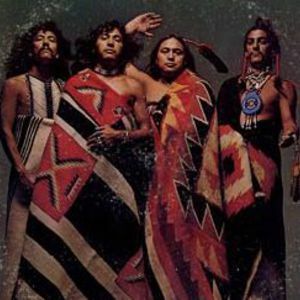 Redbone was a Native American rock group that was most active in the 1970s. They reached the Top 5 on the U.S. Billboard Hot 100 chart in 1974 with the song, Come and Get Your Love. Formed in 1968 in Los Angeles, California, by the brothers Patrick Vasquez (bass and vocals) and Lolly Vasquez (guitar and vocals), the name Redbone itself is a joking reference to a Cajun term for a mixed-race person, the band's members being of mixed blood ancestry. The band referenced Cajun and New Orleans culture many times in their lyrics and performing style. Redbone played primarily rock music with R&B, Cajun, Jazz, tribal, and Latin roots. Their first commercial success came with the single Maggie from their second album, Potlatch, in 1970, and two other hit singles followed - The Witch Queen Of New Orleans (1971, #21 on the Billboard Hot 100) and "Come and Get Your Love" (1974, #5 on the Billboard Hot 100). "Come and Get Your Love", written by Lolly Vasquez stayed in the Billboard chart for 24 weeks, and was awarded a gold disc by the R.I.A.A. on 22 April 1974. In 1973 Redbone released the politically oriented We Were All Wounded At Wounded Knee, recalling the massacre of Lakota Sioux Indians by the Seventh Cavalry in 1890. The song ends with the subtly altered sentence "We were all wounded 'by' Wounded Knee". The song reached the #1 chart position in Europe but did not chart in the U.S. where it was initially withheld from release and then banned by several radio stations. Original drummer Peter DePoe left to be replaced by Butch Rillera. Following this the band achieved much of their commercial success. Tony Bellamy (guitar, piano and vocals) was later forced to retire due to illness. One of the 1970s drummers, George Spannos, released his own hit album Passion in the Dark in 1983 under the name Danny Spanos, having a Top 40 hit single with Hot Cherie.